Instead of a simple welcome sign, add a welcome gnome to your front walkway. 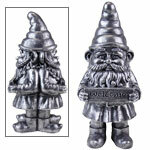 GardenFun’s growing selection of welcome gnomes is the ideal gift for a new homeowner or to spice up your existing yard. Some of our favorites come with little welcome signs to greet visitors as they enter your home or garden. All of our welcome gnomes are made from a weather-resistant cast resin to withstand the elements while decorating your garden all year round. You’ll feel right at gnome with our “Welcome to my Garden” statue. This adorable piece comes with a gnome leaning on a carved rock complete with a welcome message and decorative flowers. Its natural look will fit right into your backyard landscaping setup. We carry another “Welcome to my Garden” statue that has a faux carved log and daydreaming gnome perched on top. Its easy-to-read message is very realistic, perfect to blend into your wooded backyard. Our welcome gnomes will become a friendly fixture at your home for years to come. 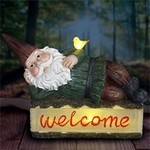 Illuminate your pathway with our gnome statue, welcome sign and lantern set. This 20-inch tall figure comes with a star-studded bronze lantern that is designed to fit a battery-powered tea light candle. 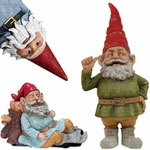 Purchase a set of four welcome gnomes to fill your yard with friendly faces. 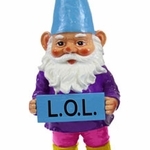 We carry two welcome gnome sets, one with welcoming messages and one with funny yet pithy signs. Our gnomes with attitude are hilarious and bold. Your backyard decor will truly be one of a kind with these bright pastel-colored figures. 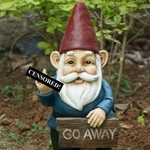 Each 13-inch gnome is carrying a fresh sign, including “Go away!” and “Bite me!” to give your guests a run for their money. Our matching set of friendly gnomes each carries a “Welcome” sign in upbeat colors. These gnomes are lacquer coated for extra protection. GardenFun.com carries more than just the latest in gnome trends. We offer the gnomes that will enhance your garden for decades!